Carpal tunnel syndrome occurs when muscles and tendons in the hand put pressure on the median nerve in the wrist. Causing pain, tingling, numbness and/or weakness in the hand. The median nerve. Runs from the forearm to the hand through a small space in your wrist called the carpal tunnel; It controls movement of the thumb and adjacent 3 fingers, but not the little finger. The carpal tunnel. A passageway located on the palm side of the wrist connecting the forearm to the hand. 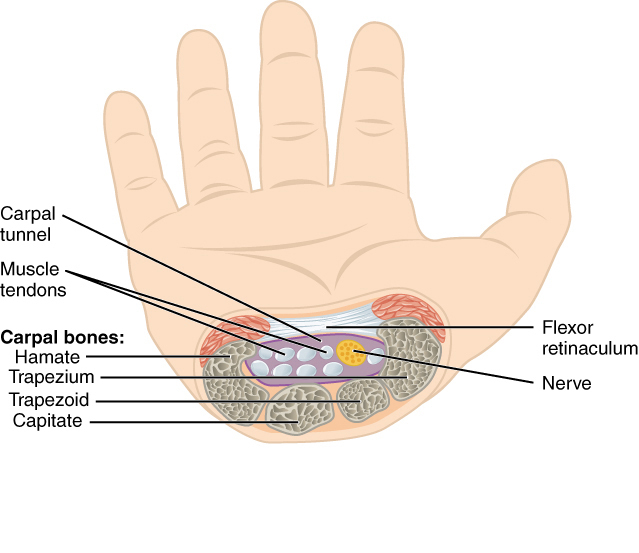 The flexor retinaculum is a fibrous ligament covering the carpal bones and forming the carpal tunnel together with the arched carpal bones of the wrist. Nine tendons connected to the flexor muscles of the forearm pass through the carpal tunnel and if any of these tendons swell or degenerate, they can "pinch" the median nerve causing pain.